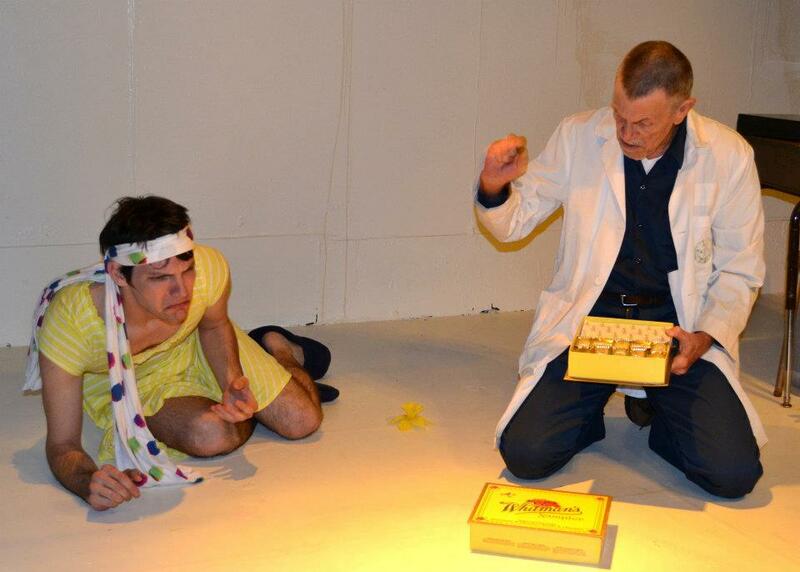 My Fort Lauderdale-based theatre company, Thinking Cap Theatre, is currently midway through a four week run of the Florida premiere of Cleansed by Sarah Kane. During post-show conversations with guests, I have found myself regularly answering the question: Why’d you pick this play? I wish now that I would have put this question back to everyone who had asked it, and I mean this seriously, not flippantly. Certainly some people have come to see Cleansed on a whim; others were drug there, perhaps by virtue of knowing someone who knew someone in the cast; and neither may have known much about the play prior to viewing. Still others, however, came consciously to see a play that they know depicts utterly awful acts: why? Not because they are sick and twisted, as some reductively insist Kane was. Maybe because they, like me, crave art that will make them think and feel, immediately and acutely. Or maybe they just want to see what all the talk’s about: “What’s this supposedly insufferable play? I can handle it.” And, actually, there’s something to the word ‘insufferable.’ Kane would not have minded viewers finding her play hard to watch: it seems most viewers do suffer by watching characters suffer in her play. But do we not suffer, in a sense, every day when we watch the news and see others suffering all around the world? Indirectly, Kane asks us to consider what is worse, to suffer or to watch others suffer (and do nothing)? Beyond the play’s power to make us feel alive, even if alive with dread or disgust or uncertainty about what we are seeing, the play also has the power to make viewers consider the core human experiences of love and loss in a new light, or worse, in a way they already had but never wanted to admit imagining. By the time I first read Cleansed, I had endured enough family deaths and romantic heartaches to have no trouble accepting Kane’s extreme and illogical metaphors for these experiences. Like Kane’s character Grace, the loss of the person in the world we hold dearest can make us, the ones left to live on, feel dead or wish we were. Similarly, like Kane’s character Carl, our intense love for another can move us to make verbal vows that we cannot physically uphold if the vows were to be tested. Finally, I would also add that I programmed Cleansed because it is a prime example of an experimental work that is informed NOT by arbitrary or amateur experimentation but by knowledge of centuries of theatre history. Kane was a ee cummings of the stage. The finest of classical, early modern, and modern dramatists echo throughout her compact, high impact, richly allusive play. Read or see it just once, and you will never be cleansed of its multivalent language and imagery. 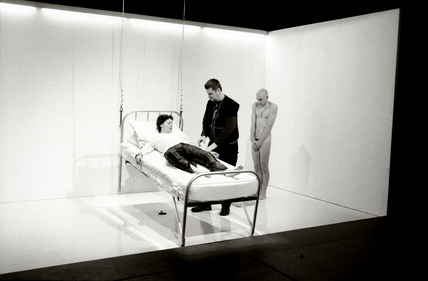 Image: Royal Court world premiere of Cleansed, 1998. A minimalist set with few signposts.